F.A. Wilhelm Construction Company Newsletter for October 2013. Marian University, a liberal arts college nestled just ten minutes northwest of downtown Indianapolis, is about to get a new living room, but it won’t be your average, hand-me-down couch and box TV. 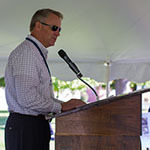 Wilhelm is serving as construction manager for the new Alumni Hall, which will stand in place of the University’s Welcome Center. 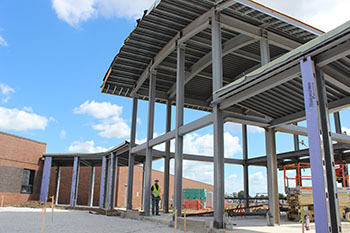 This new 19,000 square-foot student lounge will be steel-framed with masonry brick and curtain wall exterior. ‘Flexible’ is a perfect word to describe the space, as it will have a variety of seating arrangements, small nooks for group work, computer network access, audio and visual support as well as a Papa John’s, grill and Starbucks café. The lounge area has the capacity to convert to a banquet hall seating approximately 300 people. Audra Blasdel, Marian University’s project representative and the University’s Director of Projects and Procurement, adds that Wilhelm has been very helpful with keeping her updated with processes as the project moves along. “[The] team I’m working with here has been a great resource, always available, and very patient as I came on board,” Blasdel says. She adds that she is thrilled for this type of project to come to Marian University’s campus. The groundbreaking for this project took place September 21st and is slated for completion in August 2014. Since its groundbreaking in December 2012, the Joint Force Headquarters renovation and expansion project for the Indiana National Guard has been moving along in a timely and well-structured fashion, according to project team members. Wilhelm is working as general contractor on this project, located at Stout Field on the southwest side of Indianapolis. The Joint Force Headquarters services the Indiana National Guard, the Indiana Army National Guard and the Indiana Air National Guard. The renovation and expansion project will provide new offices and meeting spaces for members who are currently working at other facilities. Additionally, conference space and practice rooms for the Indiana Army National Guard 38th Division Band, which is the premier musical ensemble for the State of Indiana, are included. Mike Kerr, Wilhelm operations manager, says Wilhelm is working on the complete renovation of the existing 42,000 square-foot administration building and constructing a new 77,000 square-foot office building. Wilhelm will be relocating the existing communications center and renovating a historic air hangar to include new offices as well as renovating the entire site with new roads, parking lots, ponds and landscaping. In fact, one special feature of this project is that Wilhelm is self-performing its largest earthwork, storm, sanitary and waterline scope of work to date, according to Mitch Davison, project manager. Davison said it’s a roughly $2 million package spanning ten acres involving 15,000 lineal feet of pipe. Travis Fleetwood, general superintendent over Wilhelm’s earthwork, said that in just a couple of months, 66,000 cubic yards have been moved by Wilhelm. Pat Meehan, earthwork superintendent, says this project includes everything from demolition to finish grade. In its entirety, Stout Field will see $26 million in upgrades and renovations. Government Project Construction Manager, Eric Holst says the entire project boasts several unique design features, including structural steel frame with light gauge framed exterior walls and exterior brick veneer on the building addition to allow as much daylight as possible into many areas. He adds the roof of the office addition will be arched to resemble the World War II Era hangar on the southeast side of the field, which is on the National Historic Registry. Holst also credits the entire team for an on-schedule project and smooth conflict management. Kerr adds Wilhelm was recently awarded an addition to the project that will add a new performance auditorium for the 38th Division Band. Formed in 1917, its roots include wartime performances. All performing components of the band are in high demand statewide today. Dan Arnold, Project Superintendent, says the project is 50 to 55 percent completed. Foundations are in place for the auditorium with structural steel components beginning October 23, 2013. Arnold hopes to have it under a roof by Christmas. This fall and winter, Arnold says the focus will be on interior finishes, trim, cabinets and carpet, so that the majority of the project is habitable by June. "The past ten years have been fortunate and successful in many ways both personally and professionally. The time has been filled with happy memories, supportive friendships and good stories. It continues to be a real pleasure working alongside the accomplished characters of the Wilhelm team. I am excited about the future and look forward to continue working with my friends and co-workers." F.A. Wilhelm Construction Company has been awarded the nearly $8 million, 57,000 square-foot addition to the French Lick Event Center in French Lick, Indiana. F.A. 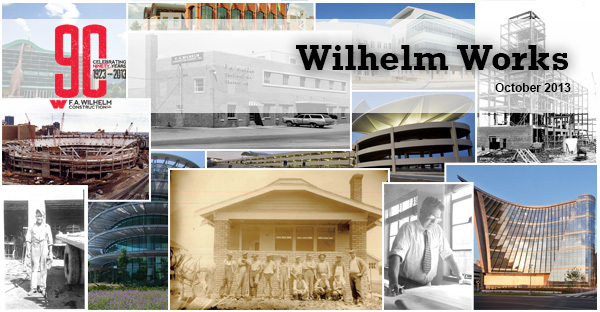 Wilhelm Construction is celebrating its 90th anniversary and through the decades, we have had several families join the ranks. We will be highlighting a few of these families in the coming issues in a series called “It’s in our Lifeblood: Families of Wilhelm Construction”. Pat Waugh didn’t know anyone at F.A. Wilhelm Construction Company when he signed on right out of Roncalli High School 23 years ago. Now, several co-workers are friends, and Pat’s younger brothers T.J. and Danny have joined him at Wilhelm through the years. Pat is currently superintendent on the Hoosier Energy headquarters project in Bloomington, Ind. T.J. worked as summer help with Wilhelm while at Indiana University. He has been full-time since and is now a carpenter for Wilhelm’s projects at Eli Lilly & Company. Danny started as a carpenter 13 years ago and now supervises Wilhelm’s concrete form work on several projects. How do you like working with family? How has Wilhelm changed since you joined the company? Tim Senkowski has sacrificed a lot for his country. In Afghanistan two years ago, Senkowski, an Army infantryman, lost both legs and suffered other injuries in a blast from an improvised explosive device (IED) planted roadside. A close friend only a few steps ahead of Senkowski was killed. A year-and-a-half of painful physical and emotional rehabilitation followed at Walter Reed National Military Medical Center. Senkowski is back in his hometown of Anderson, Indiana beginning life again with his wife, Erica, and their two children. Housing is a big need; right now, the four Senkowskis (and one on the way) live in Tim’s mother’s house. This living arrangement relocates his mother, her husband and two other children to their garage. Enter The Path Home. This organization raises money to assist veterans with food, rent, mortgage payments, house and car repairs, and other necessities, although, it hadn’t built a home until now. The home will be fully compliant with the Americans with Disabilities Act (ADA). Work is beginning now and ready for move-in after the first of 2014. It will be next door to Senkowski’s mother, Tamra Rigdon. 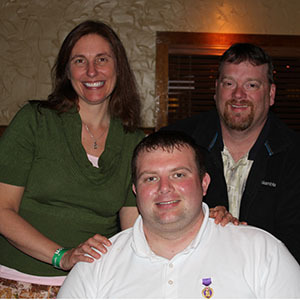 Rigdon is a therapist and caregiver who has worked at the VA Hospital in Indianapolis and the Lifeline Youth & Family Organization in Fort Wayne, Indiana. She left work to devote her full-time attention to Tim’s rehabilitation at Walter Reed. The couple has further challenges. Erica is partially disabled from rheumatoid arthritis and lupus. Their son, Dusty, suffers from autism. Rigdon says the new home will help all concerned live a normal family life. Luenebrink says while Senkowski sacrifices every day, The Path work on Tim’s house will only last about a year. Senkowski continues his long recovery, mostly at the VA Hospital in Muncie, Indiana. Rigdon reports Tim is much better since coming home, though he misses his friends in the military and looks forward to their safe return.